All links are broken,please fix them. All links besides 1-3 are broken. Please fix. hi, all links for vol 31 are broken. please help to fix, thank you! Links on Uploaded, Rapidgator are broken. Uploaded link for v22 is down. can you fix it please ? Links are dead! Please, fix them! Hi, I found “the page not found.” , please check the link. Hello! All links seem to be dead! Can you reupload please? Thanks! Hi! Datafile link for vol 18 is down. uploaded and uploadable links are not available. uploaded link is not available. Hi! Could these be reuploaded? If possible, I would suggest using a site like Mega instead since their downloads are faster and the links don’t die. Thanks! [Manga] ハイキュー 第01-15巻 [Haikyu!! Vol 01-15] all links fixed already. 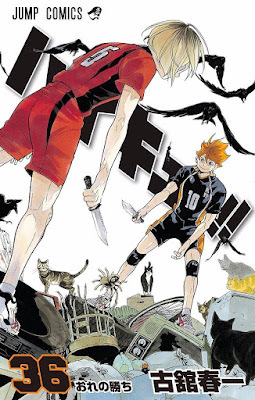 [Manga] ハイキュー 第01-14巻 [Haikyu!! Vol 01-14] all links fixed already. The Haikyuu files say that they are not available on uploaded. [Manga] ハイキュー 第01-13巻 [Haikyu!! Vol 01-13] all links fixed already. v04 has virus – detected by ClamXav on Mac OS X. We scanned v04 by KIS and no virus is founded. Please rescan by other virus scanner. Thank for your support. Thanks for checking. The scanner had detected something in the .part file. I let the download finish and rescanned the zip file – no viruses found.